A’s on the left, Giants on the right. A couple nights ago I was working a late shift at NFL Network and it was a slow news day. So in order to get my fix of my Bay Area roots, I decided to watch some baseball. As you know, I am an A’s fan so I had to watch my team play. 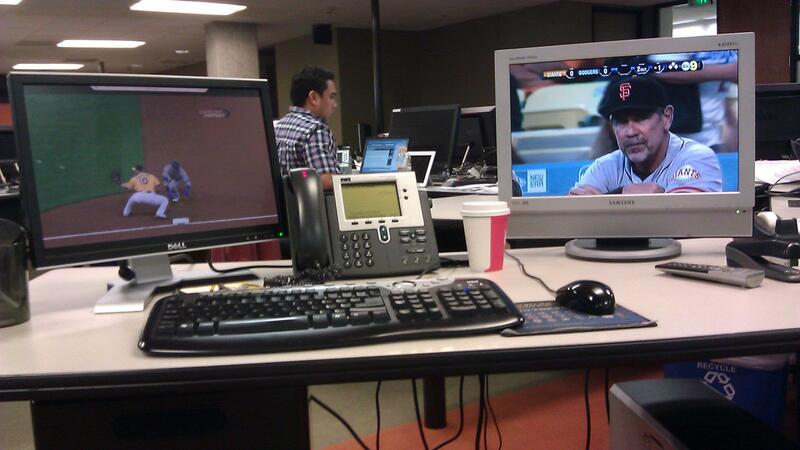 Fortunately I am subscribed to MLB.TV so I easily got a chance to stream the A’s-Jays game on my computer screen. And since the Giants were playing the Dodgers, they were on local TV and I got a chance to enjoy the awesome voice of Vin Scully. Very glad that even though I am away from the Bay, stuck in LA, I still have access to my hometown teams.